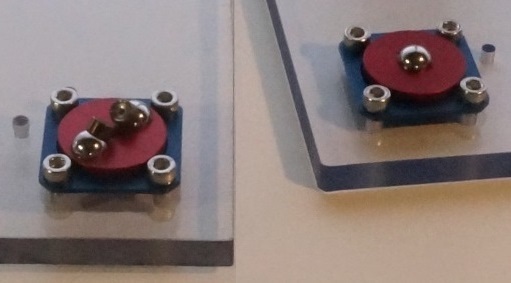 The mount enables one or more optical sub-assemblies to be replaced onto the optical table in a repeatable fashion. The subassembly can be secured in place without deforming the breadboard. For example, the mount can be used to switch between multiple beam sources or end targets, or to temporarily place a measurement subsystem into the beam path. With a load capacity of 500 kg per mount point, the OTx mounts can handle most everything you're planning to place on an optical breadboard. In fact, when using composite (honeycomb-based) boards or tables, please ensure that the maximum allowed surface loading is not exceeded, and add load-distribution plates as necessary. OTx components come in versions that support either Metric (OTM) or Standard (OTS) optical grids. 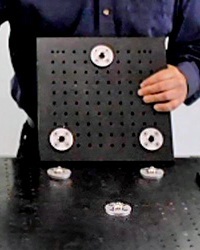 The "diamond" bolt pattern captures five adjacent grid spots, with the center one used for positioning the mating components and the peripheral ones used for clamping. To gain familiarity with both three- and four- legged mounts, we recommend the combination kit, which includes 5 mating elements (Three 2-DOF ("V") and two 1-DOF ("D")) that can be combined to form either a three-legged OR a four-legged kinematic mount.